No need to match styles, colors, or sizes! WE OFFER DISCOUNTS based on the total quantity of all the items on your order. OUR COMPETITORS only offer discounts on orders of dozens or full cases of one size and color. SINCE MOST ORDERS are comprised of multiple colors and sizes in each style, you will find the cost of your total order will be less at T-Shirt Wholesaler. By Submitting your email address, you will automatically be signed up to our Monthly Specials Campaign. The messages you will receive will only contain discount codes, coupons, and selected discounted products. You will not be signed up to any other lists, nor will your information ever be shared. The higher percentage of cotton in the Fruit of the Loom 82130 12 oz. Super Cotton Hoodie delivers big on comfort, warmth, thickness, and wearability. The lesser amount of poly (30%) still provides you with resilience and colorfastness, but affects the natural feel of the polycotton blend slightly less than other compositions. This makes the Super Cotton hoodie an ideal choice for women and men who love the organic feel and breathability of cotton. The two-ply hood adds another layer of protection and warmth for your head when outdoors, and grommeted drawcord openings keep your adjustments clean and unimpeded. The dyed-to-match drawstrings blend in flawlessly, as does the large front pocket. Ribbed cuffs and waistband infused with spandex are crafted to keep your hooded sweatshirt in place as you move around, and also minimize overstretching. Set-in sleeves contemporize and finish the look of this classic heavyweight hoodie, available in six traditional colorations. As one of the oldest leading apparel brands in the world, Fruit of the Loom has enjoyed long-running success as a result of consistently providing quality, value and style in their family of brands. They have advanced beyond underwear to include sweatshirts, sweatpants, t-shirts, tank tops and much more. 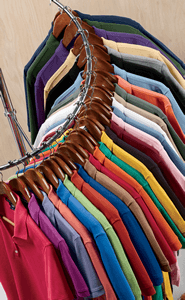 T-shirtwholesaler.com focuses on providing you with clothing items that will meet your printing and embroidery needs, offering Fruit of the Loom at wholesale prices no matter how you mix and match the items. Adhering to time-tested traditional styling, Fruit of the Loom has taken the guesswork out of what is going to look good. Their wide array of athletic and casualwear works well with other pieces in your wardrobe, and is designed to be long-lasting. From the Fruit of the Loom 3931 100% Heavy Cotton HD V-Neck T-Shirt to the SF95R Ladies' 7.2 oz. Sofspun Quarter-Zip Sweatshirt, you will be satisfied with the quality and scope of choices. Because Fruit of the Loom oversees the entire manufacturing process, they can ensure that each piece has been knitted, spun, finished, cut and sewn with you in mind. Fruit of the Loom crafts heavyweight and mediumweight garments in varying weaves and knits ideal for varying print and heat designs. Pure cotton shirts like the Toddler 5 oz. 100% Heavy Cotton HD T-Shirt are most flexible for the temperature and heat requirements of different presses and receive fashion transfers well. Premium transfers work great at lower temperatures, suitable for application on garments like the 7.2 oz. Sofspun Full-Zip Hoodie. If you're looking for a vintage or worn look, consider experimenting with polycotton blends until you find the perfect balance of these two fabrics that gives you the look you want. Whatever your purpose, you will find a Fruit of the Loom shirt, classically crafted to be the ideal beneficiary of your professional or homemade designs.